Traditional Shirt Stand Collar Colour red checked. New traditional shirt made by Orbis Traditional with innovative interesting collar solution. Classic cotton blended fabric made of 60% cotton and 40% polyester. This very fine light and smooth surface with high ease of care. 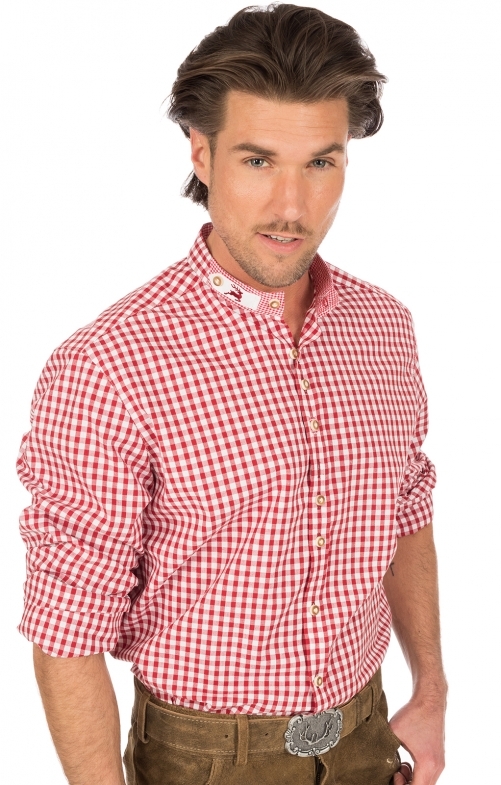 Sporty medium-width check in red white. Button placket with traditional buttons in deer horn look. Attractive youthful standing collar, contrasting with a fine check contrast fabric and deer embroidered white collar tie. This collar shape is new and also inspires men who enjoy new shirt forms. The shirt is offered in slim fit.